MIT engineers have found a way to directly "pinprick" microscopic holes into graphene as the material is grown in the lab. With this technique, they have fabricated relatively large sheets of graphene ("large," meaning roughly the size of a postage stamp), with pores that could make filtering certain molecules out of solutions vastly more efficient. Such holes would typically be considered unwanted defects, but the MIT team has found that defects in graphene—which consists of a single layer of carbon atoms—can be an advantage in fields such as dialysis. Typically, much thicker polymer membranes are used in laboratories to filter out specific molecules from solution, such as proteins, amino acids, chemicals, and salts. "If you take this to a roll-to-roll manufacturing process, it's a game changer," says lead author Piran Kidambi, formerly an MIT postdoc and now an assistant professor at Vanderbilt University. "You don't need anything else. Just reduce the temperature, and we have a fully integrated manufacturing setup for graphene membranes." Kidambi's MIT co-authors are Rohit Karnik, associate professor of mechanical engineering, and Jing Kong, professor of electrical engineering and computer science, along with researchers from Oxford University, the National University of Singapore, and Oak Ridge National Laboratory. Their paper appears today in Advanced Materials. "Scalability of these processes are extremely limited," Kidambi says. "They would take way too much time, and in an industrially quick process, such pore-generating techniques would be challenging to do." So he looked for ways to make nanoporous graphene in a more direct fashion. As a Ph.D. student at Cambridge University, Kidambi spent much of his time looking for ways to make pristine, defect-free graphene, for use in electronics. In that context, he was trying to minimize the defects in graphene that occurred during chemical vapor deposition (CVD)—a process by which researchers flow gas across a copper substrate within a furnace. At high enough temperatures, of about 1,000 degrees Celsius, the gas eventually settles onto the substrate as high quality graphene. "That was when the realization hit me: I just have to go back to my repository of processes and pick out those which give me defects, and try them in our CVD furnace," Kidambi says. "When we tried this, it surprised us a little that it really works," Kidambi says. "This [temperature] condition really gave us the sizes we need to make graphene dialysis membranes." 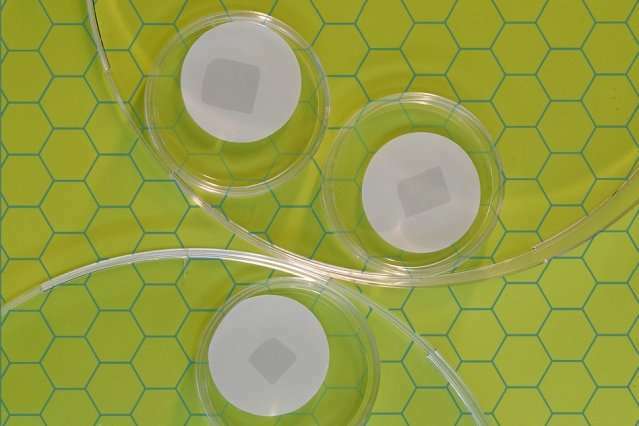 "This is one of several advances that will ultimately make graphene membranes practical for a range of applications," Karnik adds. "They may find use in biotechnological separations including in the preparation of drugs or molecular therapeutics, or perhaps in dialysis therapies." "The way graphene grows is, you inject a gas and the gas disassociates on the catalyst surface and forms carbon atom clusters which then form nuclei, or seeds," Kidambi explains. "So you have many small seeds that graphene can start growing from to form a continuous film. If you reduce the temperature, your threshold for nucleation is lower so you get many nuclei. And if you have too many nuclei, they can't grow big enough, and they are more prone to defects. We don't know exactly what the formation mechansim of these defects, or pores, is, but we see it every single time." "To the best of our knowledge, so far this is the largest atomically thin nanoporous membrane made by direct formation of pores," Kidambi says. "We now have to control these size defects and make tunable sized pores," Kidambi says. "Defects are not always bad, and if you can make the right defects, you can have many different applications for graphene."